Hot outta high school these two met at work. He winked-she smiled and they flirted the days away. He left to work for a family business and they did everything they could to keep in touch and remain friends. One day, big news came through the office that there was an opening! The first person that popped into Trey's head was his "friend" from his last job-he thought she would be PERFECT. Lauren went in for the interview, got the job, and the rest is history! After working together for several months they started officially dating! On New Years Eve, the stars in the sky led Lauren down a path that was covered in lights. She had no clue what was going on but kept following Trey down to a gazebo in his parent's backyard. He sang to her, told her how much he loved her, and got down on one knee! Everyone she loved was there to celebrate afterward. They have the sweetest 2 year old girl who reminds them daily of how precious life is and how amazing their little family has become! The moment almost seemed surreal when she saw headlights coming toward the car. Her life flashed before her eyes as the two cars collided. She was rushed to the hospital and came out with stitches in her head and her leg and a broken foot. Salvatrice and Mar had been on and off for about a year at that point but after the crash they both realized life was way too short to not chase after a love that meant the world to both of them. The morning bell rang. All the high schoolers shuffled in with their hoods up and their eyes barely open. She liked him for quite some time but Colby was shy and didn't say much. One day, they decided to hang out like high schoolers do..
From then on, it was "never if, always when"
because even when they first started dating they would say "when we get married" & "when we have kids". After high school, their worlds went two different directions. Morgan to college and Colby to boot camp. After two years of sleepless nights, longing for each other, and signing their names at the end of letters-the two decided it was time to promise forever. I simply adore the both of you. You compliment each other perfectly and it is so obvious that you belong with each other. I'm so glad your love survived the hard times and brought you where you are today. Together. Keep loving each other with everything you've got. "2002." she said confidently in front of the die hard fan, "That was the year!". A blonde hair blue-eyed beauty breezed into the party that night. John didn't really think twice until she rattled off the date of the LSU game he had just spoke about. She knew football? Everyone was baffled (well-except her brother who knew her inside and out). She continued by saying who LSU went on to beat in the national championship. This girl knew football. He stood shocked. Within a few days of her walking into the party that evening, Sheila walked into his LSU loving heart. After almost 18 months of traveling back and forth between Denver and St. Louis, John asked Sheila to be his wife for life. On April, 23, 2016, Sheila and John enjoyed their morning getting ready at the La Jolla Cove Suites. Their first look was precious. John made the funniest sound when he first laid eyes on his beautiful bride & had us all cracking up! They went off in a limo to Oceanside Beach, where they would seal the deal! Their beautiful beach wedding took place in front of crashing waves and beautiful sunlight on Oceanside Beach. With her closest friends and family standing near by, Sheila and John promised forever to each other! They got special messages engraved in their rings for each other and this was Sheila's reaction. ADORABLE. After the ceremony, we went over to the Oceanside Pier to take a few pictures as the sunset. They met in the Windy City. For some it takes years, for others it takes days. It didn't take long for these two to realize they'd like to be together for the long run! At age 17, they had it all figured out. Love wasn't confusing, it wasn't a game, it made everything fall into place.. The Marine Corps decided that these two would need to be long distance lovers. But, for Matthew and Kacey-this time wasn't going to be long. They decided to get married in Hollywood in order to be together! 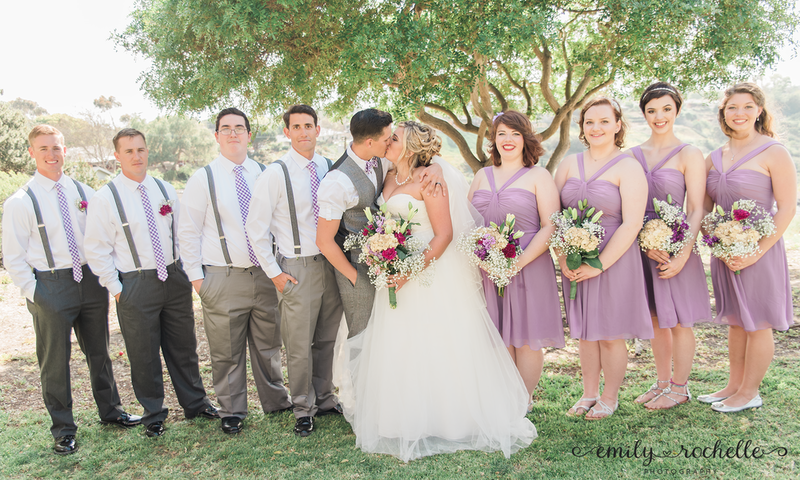 They brought their family and friends together on April 3rd at Buddy Todd Park for their stunning outdoor wedding. The gorgeous mountains and beautiful trees at Buddy Todd Park made this cute simple outdoor wedding a dream! A phone call was all it took. There is just something about long distance and fighting the fight for love that makes my heart sing. These two started their journey over the phone and did what they could to keep each other around. This love took her to Philly to meet this man she only knew by a voice. With the craziness of the hustle and bustle at the airport, she found herself lost, in a city, having no clue where he might be. At this point, ‘he’ was still only a voice through her phone but she knew she had to meet the man behind the words, promises, and affection. She started to doubt herself only to hear a small voice behind her telling her to simply, “Turn Around”. The man behind the voice. Forever was only a hop, skip, and a jump away. After that one moment, she told me, it was love at first sight and the rest is history. Their wedding took place at the gorgeous Santa Ana Courthouse in Santa Ana, California. The architecture of the Santa Ana courthouse is simply breathtaking! Kareem and Eliana, loving from afar is all too close to my heart as I’ve journeyed those roads with my husband during deployments and field ops. Loving from a distance is no easy task and it definitely isn’t for the weak at heart. I’m so glad you two have found your forever, together. Life will surely start to make more sense now. Thank you for trusting in me to capture the love that overflows from the two of you! Whats a first look? Will the first look take away from walking down the aisle? Will he be faking his reaction after the first look? These questions come up all the time during wedding planning. A first look is the opportunity a bride and groom has to see each other before the ceremony! Whaaaat? Won't that ruin the moment I walk down the aisle? I'll get to that. :) Here is a photo of one of my favorite first looks this year! I mean, look at that tear! I got to see his reaction…& be there to kiss him afterwards! Lots of photographers will say, “Its such a special moment between the two of you!” Well-if your friends are ANYTHING like mine-they will sneak their way out of the barn, suite, hotel and watch the whole thing happen. Ha! See all those people watching behind us? Talk about real life wedding day right there! But, I will say, seeing his reaction for the first time, up close, was an awesome feeling. He said ooooOOOOOOO! Really loud! HA! He continues to make me laugh and smile to this day. I got to spend more of the reception with my friends and family that sacrificed a weekend night for me! The moment I started walking down the aisle, we were able to focus on FOREVER...& thats when the tears came. First looks are becoming more and more popular! As a photographer, I love getting the natural but posed photos done before guests arrive so that more candid fun photos can take place afterwards. You may find that your day doesn’t feel as rushed if you do a first look! Will I still be your photographer even if you choose not to do a first look? No. HA! Just kidding. Honestly-I don't care either way! But-I chose the first look & I'm so glad I did! Either way its going to be the best day of your life!